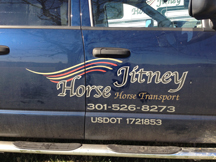 horsejitney llc a Maryland horse transport company providing horse transportation to east coast horse shows. Contact us at 301-526-8273 for all of your horse transport needs east of the Rockies. We are based in Howard County, Maryland, but spend most of the time on the road, so you never know, I just might be in your neighborhood for that last minute transport. I quote trips based on the zip code of the pickup and delivery address, number of horses you are shipping, and your preference of a box or straight stall. Tolls are inluded in the quote. Yes, you can expect to pay at minimum $1 per loaded mile, varying depending on current fuel prices in states traveled en-route. Tolls are split among horses traveling same route! We are USDOT and FMCSA licensed and carry $750,000 in liability insurance and $25,000 in cargo. The USDOT number is 1721853 and Motor Carrier number is 634408. We strongly encouarge you to check out the Federal Motor Carrier Safety Administrations website at www.safer.fmcsa.dot.gov which allows you to research a company's registration, insurance, and accident history for any horse transport company you are considering. A valid coggins is required for horses traveling within Maryland and between Maryland and Northern Virginia, but a health certificate is required when moving across state lines. Some states have additional vaccine requirements. We do our best to stay apprised of the various state rules, but ask our clients to participate in learning about the requirements for their horse's travel.